Anyone who has investigated becoming a pilot knows that aviation is sold by the flight hour. Anyone who’s ever rented one should find this interesting: the Fiscal Year 2019 Department of Defense Fixed-Wing and Helicopter Reimbursement Rates for the Air Force, Army, and Navy. “When determining the hourly rate, agencies should utilize the appropriate rate category.” They are, Other DoD, Other Federal, Foreign Military Sales, and All Other. Civilian use, such as movie making and the like, would be All Other. Unfortunately, the document makes no mention of stick time, but I imagine that’s not the case for Foreign Military Sales, where the hourly rate would be for demo flights? Like all rentable aircraft, I’m sure the DoD computed the hourly fees by summing the airplane’s operating and fixed costs such as fuel, scheduled maintenance, and engine and system overhaul funds, added the cost of human resources, the people who fly and maintain the aircraft, and divided that number by however many hours they expected to rent each aircraft every year. What’s interesting in paging through the document is guessing at the contribution of each factor for the (All Other User) hourly rate. Among Air Force bombers, the B-2 goes for $62,012 an hour. That’s roughly $10K more than the B-1 ($51,475) and nearly double the B-52’s $33,919. This explains why the B-52 continues to serve, and it makes one wonder what the hourly rate will be for the B-2’s replacement, assuming there is a B-21. A good guess would be that it is nowhere close to the hourly difference for the Navy’s long serving patrol plane, the Lockheed Electra-based P-3 Orion, which rents for (All Other Users) $9,015 an hour, and its replacement, the Boeing 737-based Poseidon, which goes for $9,928 an hour. There seems to be only one aircraft, the Beech Super King Air-based C-12 Huron, in service with all four branches of the U.S. Military. (Given their special relationship, Marine aircraft, like the AV-8 Harrier, $13,768 an hour, are listed with the Navy’s birds.) The Army rents its C-12 to All Other Users for $2,226 an hour. The Navy/Marines rents their UC-12-Ws for $2,497 an hour. The Air Force rents its C-12C for $3,341, its C-12F and C-12J for $$3,350. The cheapest aircraft on the list is the T-6 Texan, the winged classroom used in Air Force and Navy primary flight training. The Air Force rents its T-6A for $917 an hour. The Navy rents its T-6A for $1,877 and its T-6B for $1,839. It’s interesting that the B-model with its glass, HUD, and Hands on Throttle and Stick cockpit rents for the lower amounts. 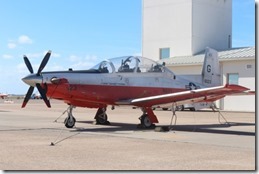 Another question is why the Navy’s T-6’s rent for almost double the rate of the Air Force. Is it because the Air Force flairs to land and the Navy planes, given their carrier heritage, arrive? The document’s final tables may provide a clue. They subdivide the total hourly rental into O&M (Operations and Maintenance), MilPers (military personnel involved with operations and maintenance), and Utl (asset utilization fee). It costs the Navy $1,621 an hour to operate and maintain its T-6A; it costs the Air Force just $794. The Air Force also charges a lower utilization fee, $34 per hour to the Navy’s $72. Finally, it seems that either the Air Force pays its personnel less, or there are fewer personnel involved. The Air Force charge is $88 an hour to the Navy’s $184. Enlisted Pilots: Has Their Time Come Again? Will Army Drones Spark Interservice Rivalry? This entry was posted on Monday, March 25th, 2019 at 8:00 am	and is filed under Aerospace, General, Military. You can follow any responses to this entry through the RSS 2.0 feed. You can leave a response, or trackback from your own site.